Trec BCAA G-Force 1150 is a preparation that contains ingredients selected in optimal portions and in a convenient form for consumption - they include branched chain amino acids (BCAA) with the addition of L-glutamine. Thanks to this combination, it is possible to effectively support anabolic processes, maximize the ability to rebuild stronger muscle fibers and stop catabolism. The human system produces several dozen grams of new proteins every day, some of which are structural proteins of muscle fibers. This amount depends on the damage to the muscle tissue, and this in turn is a result of the conducted strength training. Not only the training itself determines the efficiency of the formation of new proteins. The second very important factor is the availability of building material, which consists of macromolecular proteins - amino acids. Some of them are formed in the body from other intermediates (non essential amino acids - NEAA), while a certain amount must be supplied with food (essential amino acids - EAA) so that the optimal nitrogen balance can be maintained. Intensive training - both strength and aerobic - predisposes to the increased need for proteins. It is worth knowing, however, that not every protein will achieve the same biological effect (anabolism) due to the different amino acid composition of various proteins. To cover nutritional deficiencies, it is worth to use a supplement with the best composition. From the EAA, three compounds with a characteristic type of construction can be distinguished. BCAAs (branched chain amino acids) have significant anabolic potential. It is largely thanks to them that it is possible to effectively repair damaged muscle fibers, as well as to limit catabolism after an intense exercise. Numerous studies have shown that L-leucine is characterized by the acceleration of protein biosynthesis processes. This may give rise to the erroneous belief that it is the only branch amino acid necessary for the described changes to occur. However, it was observed that the deficiency of L-valine and L-isoleucine strongly limited the anabolic potential of BCAA. Muscle tissue, performing hard work, produces nitrogen compounds that need to be recycled. The easiest way would be to produce ammonia, and the remaining carbon could be used as a metabolic fuel. Unfortunately, this is impossible because ammonia is a potent neurotoxin that seriously disturbs the function of the body. In order to get rid of it, the amino residue is transferred between the two amino acids. The addition of L-glutamine to the preparation is not a coincidence! It is true that it belongs to NEAA, but increasing its systemic pool allows free use in muscle cells to the described transamination process. As a result, it provides powerful support for regenerative processes in the muscles. It is also worth mentioning that glutamine is an energy substrate for two types of cells - enterocytes and lymphocytes. Proper nutrition of the first of them ensures maintaining a healthy condition of the digestive tract, minimizing digestive disorders and proper absorption of nutrients - building blocks for muscles. For the second type of cells, the amino acid may prove to be an important immunomodulating agent that supports the immune system. Thanks to this, avoiding infection will be easier. In summary, Trec BCAA G-Force 1150 is a dietary supplement maximizing the intensity of anabolic processes, as well as promoting muscle regeneration, so that the adepts of the strength sports that use it will clearly experience increases in strength and muscle mass. 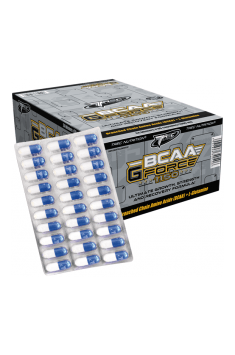 BCAA G-Force 1150 30 caps. I portion (4-6 capsules) 30 minutes before training, II portion (4-6 capsules) immediately after training. I portion (4-6 capsules) in the morning after waking up, II portion (4-6 capsules) before sleep. The product is intended mainly for people who want to effectively intensify the muscle growth in the period of mass building, or to limit catabolism during the weight reduction. A good idea may be to include whey protein supplementation in order to supply the remaining essential amino acids EAA, as well as creatine, which will increase the anabolic effect of leucine and speed up the effects.